The most amazing power of the Black Widow spider isn’t its fearsome venom. It’s the incredible properties of the silk fibers it spins to build webs for capturing prey—a substance tougher than the Kevlar in bulletproof vests. An artificial version with the same qualities would have unlimited practical applications, from building materials for bridges to an environmentally friendly replacement for plastics. Now researchers at San Diego State University and Northwestern University have a much better idea of how the silk-producing process begins. They have developed a molecular model of the silk protein structures that kick off the conversion of liquid to thread. Gregory Holland, SDSU associate professor of analytical chemistry, and Northwestern chemistry professor Nathan Gianneschi said their collaboration shows the organization of the molecules involved in silk production is more complex than previously thought. Funded in part by the U.S. Department of Defense through the Air Force Office of Scientific Research, the findings were published today in the journal Proceedings of the National Academy of Sciences (PNAS). In the study, the two labs used different but complementary techniques to examine the nanoscale structure of micelles, a structure of molecules in liquid, involved in the very first stage of formation of the black widow’s dragline silk. At SDSU’s Chemical Sciences Laboratory, Holland and his team used nuclear magnetic resonance (NMR) spectroscopy, the same technology involved in a hospital MRI to image soft tissue, which observes magnetic fields around atomic nuclei. At Northwestern, Gianneschi employed high-resolution cryogenic transmission electron microscopy, a state-of-the-art, Nobel-winning technique to flash-freeze a solution and examine the nanoscale structures of protein molecules. “What we didn’t understand completely is what goes on at the nanoscale in the silk glands or the spinning duct—the storage, transformation and transportation process involved in proteins becoming fibers,” said Gianneschi. With two premier methods for determining biomolecular structure, the collaboration provided direct evidence the structure of the micelles is more complex than the spherical structures that had been hypothesized. “It was the combination of these two advanced methods that allowed us to put together a truly convincing story,” said Holland, whose work with Gianneschi began when the latter was a researcher at the University of California, San Diego. Black widows (Latrodectus hesperus) spin a lightweight thread much stronger than that of other spider species, with draglines that can stretch an extra 25 percent of their length before snapping. The composition of the spun silk fibers was previously identified, but the structure of the proteins involved in producing them has been more of a mystery. Several scientists tried to produce synthetic spider-silk fibers, but their work was based on small, spherical protein micelles, and the properties proved to be inferior to those of natural spider silks. If a better and cost-effective version of synthetic spider silk could be developed, Holland said, it could be used as a super-strong material in military and industrial products, and as a biodegradable replacement for plastic. It would also hold promise for biomedical purposes, as is already the case for silkworm silk. Lead authors for the PNAS paper were David Onofrei of SDSU and Lucas Parent of Northwestern. 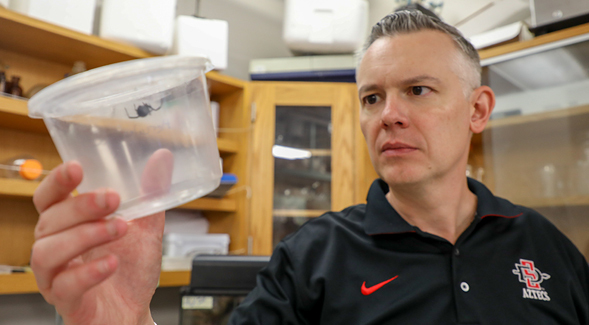 SDSU associate professor of analytical chemistry Gregory Holland holds a Black Widow spider.